Enjoy Learning a Trendy Instrument. Enrol for Classes and Start Playing Exciting Rhythms on the Cajon! Do you unconsciously tap your feet to a tune? Does music energise you, and move you to the beat? Then it’s time to take it to the next level — learn to play the cajon! BEAT’ABOX is Singapore’s first and largest cajon school, with a proprietary, progressive syllabus for learning the cajon. At BEAT’ABOX, we have trained thousands of people to play the cajon — as a hobby, for relaxation and professionally — using our progressive, structured syllabus, which takes you from beginner to mastery level. Students will also have opportunities to perform on stage with other musicians. Learn to Play the Cajon in a Fun and Collaborative Environment! Q: "Do I need to have prior music knowledge to play the cajon?" Prior music knowledge is not a requirement to play the cajon. Here at BEAT'ABOX, we pride ourselves on our proprietary, progressive curriculum. 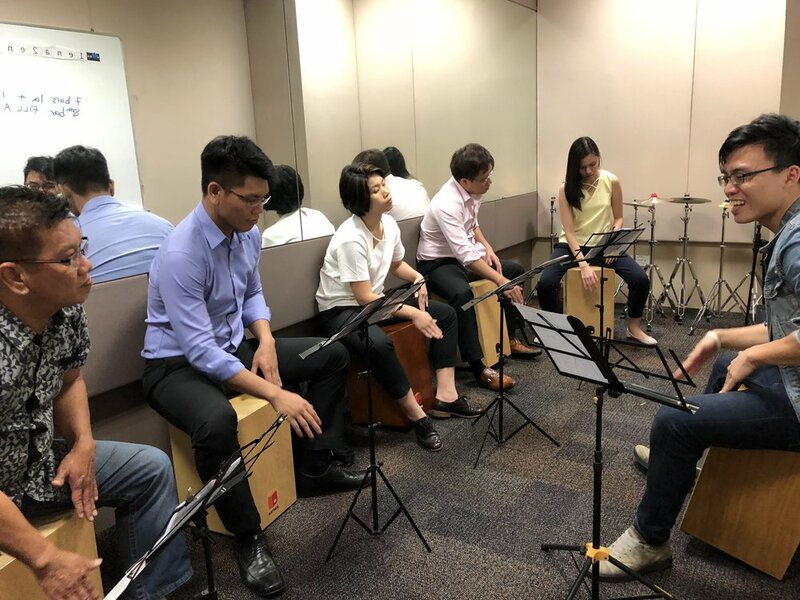 Since 2011, we have successfully trained students from all walks of life; be it young or old, musically-trained or a layman, we've always seen students enjoying the cajon and discovering the musical talent within them! Occupation: Secondary School Students, NSFs, University Students, Working Adults, Retirees, Housewives, etc. In Cajon Module 1, you will be taught foundational techniques in playing the 3 main cajon tones, and 22 different 8-beat rhythm and fill patterns. At the end of Module 1, you will be well-versed in applying various rhythm and fill patterns to a repertoire of about 15 to 20 current songs! In Cajon Module 2, besides Rock and Pop music, you will be introduced to more music genres. You will be learning variations to the 8-beat rhythm and fill patterns from Module 1, to make your cajon playing more interesting. Additionally, you will be learning 8 different 6-beat and 12-beat rhythms and fill patterns, that you can play along to soothing blues music. At the end of the course, you will be well versed in applying these rhythm and fill patterns to a new repertoire of 15 to 20 songs! In Cajon Module 3, you will translate 8-beat rhythm and fill patterns to play them in 16-beat. Following that, you will be learning to jazz up your playing by adding simple offbeat accents to the rhythms and fill patterns. You will also be learning how to read cajon notation for 8-beat rhythms. At the end of the course, you will be well versed in applying 16-beat rhythm and fill patterns to a new repertoire of 20 to 25 songs! At the same time you will also learn how to do simple rhythm arrangements to your personal choice of songs. In Cajon Module 4, you will be learning how to further jazz up your cajon playing with complex offbeat accents to 16-beat rhythm and fill patterns. Apart from playing to music with straight counts, you will also be learning how to add simple offbeat accents to 6-beat and 12-beat rhythm and fill patterns. You will also learn how to read cajon notation for 16-beat rhythms. At the end of the course, you will be well versed in applying the various rhythm and fill patterns to a new repertoire of 20 to 25 songs, as well as how to do rhythm arrangements to your personal choice of songs. In Cajon Module 5, you will learn how to use percussive accessories such as foot jingles, splash cymbals and wired brushes to enhance the Rock, Pop and 6/8 rhythms, that you have learnt in the previous modules. You will also learn how to read cajon notation for 16-beat rhythms. On top of that, you will be introduced to basic Jazz rhythms, and how to use the percussive accessories to accentuate the Jazz feel in your cajon playing. You will also be taught core rhythms for Bossa Nova music, which are commonly heard in Bossa Nova songs, and how to tone up the Bossa Nova feel through the percussive accessories. Learn to Play Modern Cajon Rhythms in the Heart of Town! 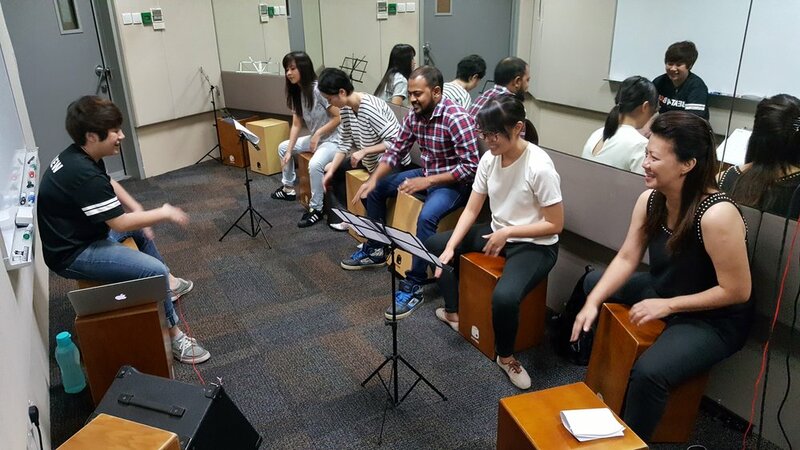 BEAT'ABOX cajon lessons are held in our studios at *SCAPE, a short walk from Somerset MRT or Orchard MRT. Cajons are provided in our music studios, so students can come to class without having to carry their instruments. See how much fun our students are having! Looking for Cajon Workshops Instead? If you are looking for an engaging activity to bond your staff together, our team-building cajon workshops are perfect for you! Let us know how we can serve you. Bring out the creativity in your students in our cajon workshops specially catered for students! We've taught students from the Primary, Secondary and Tertiary levels.